Double gatefold sleeve. Tracks listed sequentially. Features lyrics in the inner artwork. First catalog number from packaging, second one from labels. No full credits present. Mastering and pressing credits adapted from runouts. Reprise Records, A Warner Music Group Company. © ℗ 2004 Reprise Records. great album but after a while its annoying. 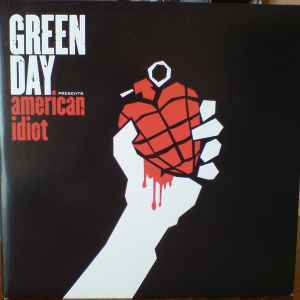 I remember that in late 2004 my american cousin visited us and he had a copy of this album which we were listening. I hated that album but all of the other guys liked it. My copy has a bad sound and everyone here is saying that this has an amazing sound. I really don’t get it. Agree with other comments, this pressing sounds great. Was very impressed as bought still sealed and have had no issues with static. Fantastic sound from this pressing. Puts the rest of my small collection to shame. The others are right- great sound on this pressing. Clearly mastered with care. This pressing is really nice, better than I expected. Notable improvement over the CD, of course. The only real downside here is the inner artwork. Kinda dull in contrast to the original hand-written booklet. UPDATE: compared to the US masters. Get this one if you're more interested in good sound, the US one is overblown with bass. This record sounds amazing on vinyl. I bought a sealed original (2004) and unlike some new records I get there was no static or dust, it sounds loud and clear.